We are pleased to announce our newest product – Think Protection Battery Powered Wireless Outdoor Camera! 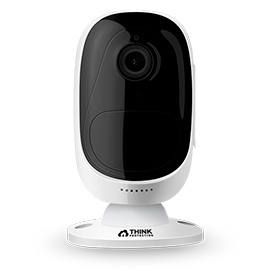 With the Think Protection Wireless Outdoor Camera you’ll be able to see outside your home through your smartphone or tablet from anywhere in the world. Our outdoor cameras are completely wireless and take around 5 minutes to set up and install. Think Protection Wireless Outdoor Cameras are far and away the best way to protect the exterior of your home. 100% wireless technology – no ugly power cords running along the outside of your home! Easy to install – takes around 5 minutes! Up to 180 days battery standby time! Live streaming video – anytime, anywhere! Smart motion sensor with push notification capability! Weatherproof design – Can handle all elements! Two-way voice – speak to whoever is there through the camera! The price of the Think Protection Outdoor Camera is incredible – only $199.99! And if you bundle the camera with a new Plus Package (only $449.99) you’ll save $80! Plus if you buy yours in September you’ll also get FREE shipping (an additional $25/savings)! The savings are incredible! And you’ll be receiving the best security in the industry! Think Protection Wireless Outdoor Cameras come with a 30-day money back guarantee and a 1-year warranty. The camera is incredibly easy to set up and will provide unmatched peace of mind. And there are no additional monthly charges with Think Protection Wireless Outdoor Cameras! Order your Think Protection Wireless Outdoor Cameras today by calling 1-855-768-4465 or click here to find out more about these incredible cameras.